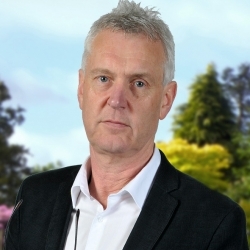 Robert studied Mass Media Communication at Aston and Creative Photography and Film Making under Paul Hill and Tom Cooper at Trent and Derby before moving to London in 1977 to work as a freelance photographer. Melody Maker, New Musical Express, Sounds, Spare Rib and a fledgling Time Out all published his work along with the established and independent Record companies. Robert wrote a weekly column for the Daily News during the late 1980's and concentrated his experiences into developing Hall's Garden Supplies, established in 1952 by his father Gerald Hall. Robert launched the first version of GardenSite in 1999. Today it is established as one of the leading authorities in its sector and still follows his original maxim of offering the same level of personal service online as in store. His purchase of the adjacent New Oscott Tavern in 2010 has enabled the original garden centre to develop into a 2 acre show site. Robert is married to Kay and they have 2 daughters, Frankie is in her final year at Exeter University and Gabrielle has just started at Sheffied University. His work has been published locally and nationally over the last 30 years. Follow his advice, tips and traumas here. Many people are likely to be contacting their insurance companies at some time regarding damage caused to sheds, greenhouses, fences and other garden property. Robert Hall explains how GardenSite.co.uk can help with an independent insurance quote and claim. Published on Thursday, 7th of December, 2017. Ever the proud father you can imagine how proud I was when both my daughters started full-time work this week. Published on Friday, 9th of September, 2016. Published on Thursday, 15th of June, 2017. Trimetals metal storage solutions continue to be popular best sellers on GardenSite and the company has now been officially recognised as one of Britain's 'brightest businesses'. Robert Hall learnt of this latest achievement on the Queen's birthday. Published on Friday, 22nd of April, 2016. Early last year Nathan James Dodd, our Marketing Manager, took a phone call from the production company behind Beowulf, ITV's new action packed drama series. Gardensite.co.uk is very proud to have received the award for 'Best Online Garden Retail Buying Team' on the second day of Glee 2015. Robert Hall, Senior Partner, was at the show when the winner was announced. Published on Tuesday, 15th of September, 2015.